I Used The Final Oculus Rift. Here Are The Games Worth Playing. I don’t know what the final Oculus Rift virtual reality headset will cost. The fact that it won’t come with its amazing motion controller makes me want to wait. But even with just an Xbox One gamepad, there are already mindblowing experiences to be had. Here are all of them. First, a note on the final Oculus Rift hardware: it’s definitely got better ergonomics than the Crescent Bay prototype that blew me away last September, and it feels a little more solid, but it’s really not all that different. There’s still a little bit of the “screen door effect.” If you look closely, you’ll definitely be able to see the world around you is made up of pixels that live scant inches from your face. And if there’s, say, a bright torch in a dark room, you’ll still see it glinting off the lenses, which can detract from the experience a bit. While it’s fairly light and comfortable, it still takes a little bit of work to adjust the velcro straps each time you put it on your head. I definitely prefer the hardware design of Sony’s Morpheus—except the Morpheus doesn’t have nice integrated headphones like the Rift. Every time I tried on a Morpheus, Sony tried to stretch normal headphones around the frame, and they always felt like they were falling off my head. But enough of that. Let’s talk about games. Be sure to click on the videos. What’s it about? Think Zelda meets Dark Souls, with art that recalls Shadow of the Colossus. You control a young man armed with shield and sword, exploring a huge labyrinth. At least at first—later on, we’re told, you’ll be a weak old man who uses magic to get around. Enemies are tough, and if you die, you go all the way back to the beginning... at least, in my demo. What’s the big deal? The sense of scale is incredible. You start out on the edge of a cliff, at the entrance to a labyrinth carved into an immense mountainside. Like, look-up-and-see-the-mountain-scrape-the-sky tall. Look down into the abyss, and there’s no question it’s a fatal drop. It’s a third-person adventure game, so it doesn’t feel like you’re “there” too much more than your typical video game. At most, you’re playing the role of guardian spirit as you use fairly traditional third-person game controls to move your hero around and (beautifully, the animation is lovely) swing his sword and shield and nimbly prance around foes. But the Oculus makes the world feel properly gigantic. Humbling. Old. The game shifts your perspective as you go into each new room, but does so instantly—it didn’t make me feel sick at all. You can just sit in your chair, and occasionally lean into the environment (!) to see around corner or examine things more closely. I also love how the game lets you know when your hero is near death. There’s no tacky user interface cluttering up your vision—you’ll just hear his heartbeat quicken, see him begin to stumble and tire as he walks, until he’s totally exhausted. What’s the big deal? Again with the sense of scale—only this time, your third-person adventure is through a frozen world filled with grotesque creatures right on your heels. Chase scenes are a staple of action-adventure video games. I’ve played my fill, but I’ve never experienced anything quite like this. It’s one thing to run and jump every time you see a ledge, or dodge every time you see an obvious indication that something’s about to fall on your head. It’s another entirely to look over your shoulder—literally—and get a glimpse of the horrific spider-like beings chasing your hero. To look up in the sky and see the boulders falling down on your head. To look down, as the rickety wooden bridge collapses under your feet, and feel a sense of vertigo as you stare into the abyss. To realize that contemplating your death can actually make it come true—because seeing these things can keep you from making the carefully timed jumps that are normally so easy in games, because they let you focus on the task in front of you. What’s it about? A cute cartoony fox does his best Super Mario impression, exploring a colorful world filled with traps while collecting coins and stomping on baddies’ heads. What’s the big deal? Hopping from platform to platform in three dimensions has never felt so effortless. There’s no need to turn a camera or wonder where you need to go: you can just move your head around to see the whole level laid out in front of you, then hop-hop-hop your way through. Most jumps aren’t difficult because you have real depth perception, and can thus tell how far Lucky needs to hop to get where he’s going. Even though it’s a third-person game, it made me feel incredibly agile to go through nearly an entire level hopping from platform to platform without skipping a beat. Kind of like an expert Mario player, but on my very first try, without needing to study the lay of the land. What’s it about? A real-time strategy game with a twist: you control a mech that transforms into a lightning-fast fighter jet—one that can also carry tanks and artillery into battle and drop them anywhere. You play from much the same perspective you see in the video above, except you can look around anywhere. No need to pan a camera. What’s the big deal? It’s like playing with Transformers toys. Ones that actually TRANFORM and FLY and BLAST THINGS on cue! You’re right there, inside of that world. That’s a big smile on my face just thinking about it. And forget about zooming in and out—you can just lean in closer to your to inspect your base in glorious 3D. If only I’d had someone else to play with. What’s it about? You’re an AI construct, I think? Trying to save humanity from being oppressed by enemy soldiers made of living code? Clearly, the game takes place in a highly advanced civilization, where you generally act as a stationary sniper—think Silent Scope—that also happens to be hacking into enemy systems and blasting away with powerful missile and machine gun programs from your perch. What’s the big deal? Other than being, well, fun, and it being kind of neat to shoot things with beams of light and missiles that follow your gaze—not to mention having superhuman sniper vision—it’s pretty damn awesome to look all around you and see the colorful neon world. It’s one of the rare first-person games that Oculus is showing, and it gets away with it by letting you warp from perch to perch (you’re a computer program, after all) instead of walking. I’ve saved the best for last. EVE Valkyrie (also in development for Sony’s Morpheus) is the ultimate VR game as of today. You enter the incredibly detailed, battleworn cockpit of a starfighter, and engage in glorious white-knuckle dogfights with enemy craft in three dimensions. You can feel how gigantic the capital ships are as you skim along their bulkheads, defending them from damage. You can fly so close to them because you can natively understand how large your craft is. When a foe flies past, out of your crosshairs, you won’t need to consult your radar or guess where they went—you can actually follow them with your head. And when you take damage, it isn’t just on some gauge or indicator—the cracks in your cockpit let you know when you’re close to catastrophe. 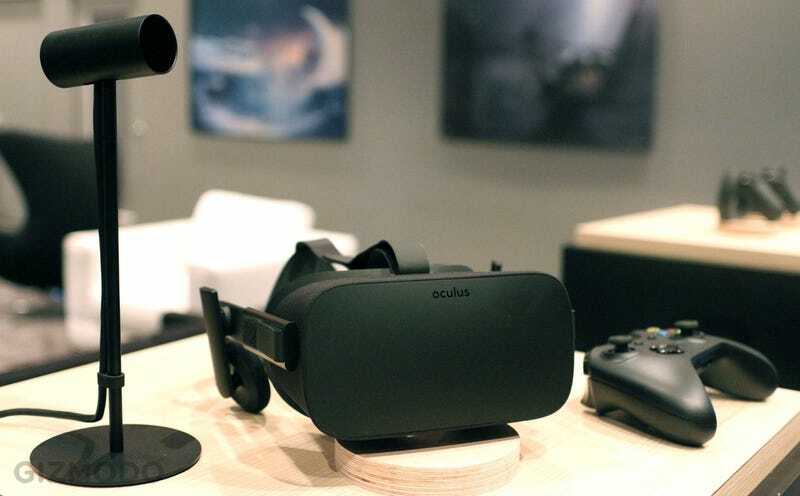 For a while now, Oculus has said the first consumer version of the Rift would probably only offer “seated experiences”—a phrase that’s riled up VR enthusiasts who want more. I’m one of them.Yes, I definitely crave games that let me actually reach out and touch things in virtual reality, and for that I’m going to need a fancy controller... but I’m starting to think that seated experiences with a traditional gamepad might not be so bad, either.